134 photographers spanning 27 countries submitted a picture for the Mirabaud Yacht Racing Image award 2017. Sören Hese (GER) wins the main prize, whilst the delegates from the Yacht Racing Forum and World Sailing’s annual conference elected Tomàs Moya. Zita Kovács (HUN) obtained most votes on the social networks and wins the Public Award. No less than 134 photographers spanning 27 countries took part in the 8th edition of the international photo contest Mirabaud Yacht Racing Image. The pictures submitted illustrate the sailing season 2017 and highlight the extraordinary variety of the sport in all its aspects. The international jury decided to honor German photographer Sören Hese and his surprising picture taken from a drone during the 5O5 German championships. Based in Berlin, Hese has been working as an independent photographer since 1990. "I am very proud because this contest is the absolute reference in yacht racing photography ", he said. "I took this picture using a time-motion-stack imaging concept, capturing the image basically as a time series from a quadrocopter. I found its graphical structure very interesting and also story telling, and so decided to submit it to the contest. I am very touched by this victory, against all those prestigious photographers. There were also so many major international events this year that I am really surprised to have won." 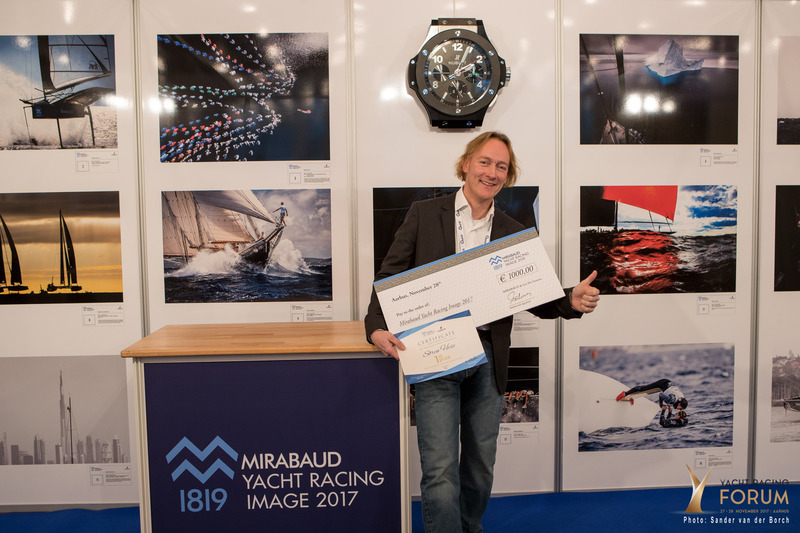 The Mirabaud Yacht Racing Image Award has once again been met with enthusiasm by the public and on the social networks. More than 20’000 votes have been accounted, whilst the event website has been visited by 2,2 million people. Sören Hese has been celebrated tonight in front of the international sailing community, at the Yacht Racing Forum, in Aarhus, Denmark. He received the prestigious title, a wall clock provided by luxury watchmaker Hublot and € 1’000 prize money. Dmitry Sharomov (RUS) and Sander van der Borch (NED) complete the podium. The nations most represented amongst the top 20 are Russia and France, with four photographers each. "Sören Hese’s picture is very interesting, original and technically quite complex", said Rob Kohte, founder of the Sail-World network and a member of the jury. "It gives us an idea of the type of pictures we will see in the future, thanks to the extended use of drones. I think that there was more originality and also more humour in the pictures submitted for this edition." "This contest is more and more successful over the years and the group Mirabaud is proud to be part of it since day one", says Nicolas Mirabaud, member of the international jury and of the Executive Committee at Mirabaud & Cie SA. "Once again, the pictures reflect values that are dear to us such as performance, teamwork and technology. It was a great pleasure to discover the photographers’ work". Tomàs Moya wins the Yacht Racing Forum award, based on votes from the delegates of the Yacht Racing Forum and World Sailing’s annual conference in Puerto Vallarta (MEX). Zita Kovács wins the Public Award, based on votes by the public on the social networks.